Vikki graduated from San Diego State University where she received her Bachelor of Science Degree in Accounting with a Minor in English. Vikki received her Masters in Taxation at Golden Gate University in May of 2006. She is a Certified Public Accountant in the State of California. She is a member of the American Institute of Certified Public Accountants and the California Society of Certified Public Accountants. 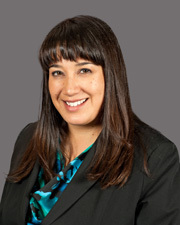 Vikki spent a year and a half working as an accountant at the City of Daly City and her college years working part time for both municipal government and nonprofit organizations prior to joining the firm in 1998. Vikki has accumulated over 360 hours of continuing education in the past three years as an instructor, participant and student. She has attended the past four annual Nonprofit Organization Conferences held in May. Vikki sits on the non-profit boards of the Center for Human Development and Las Trampas.